Pictures taken just south of the ABDSP Visitor Center on 20 February 2015. 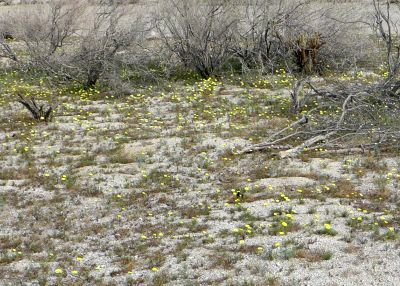 Left: A field of desert dandelion, Malacothrix glabrata, immediately south of the Visitor Center Parking lot. Right: Flower of brown-eyed primrose, Chylismia claviformis ssp. 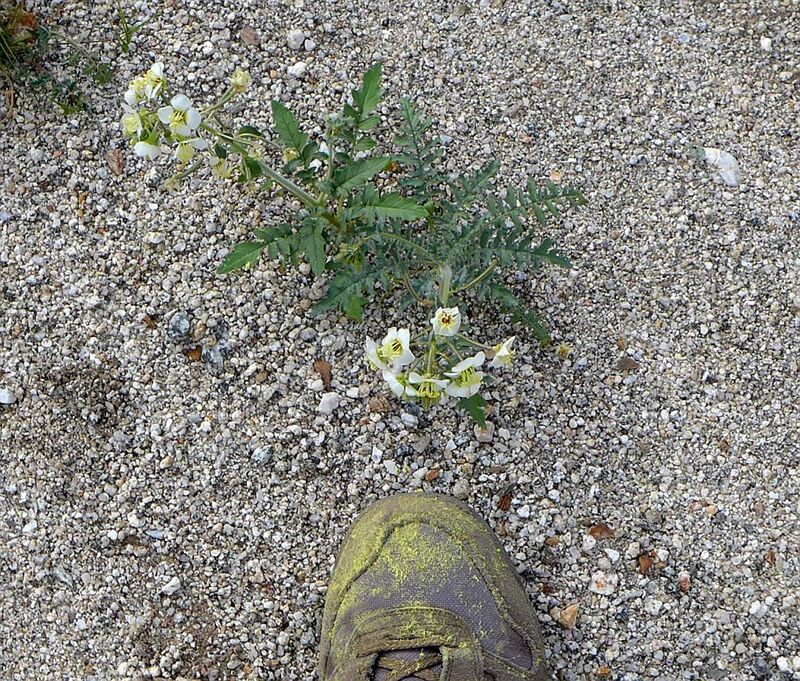 peirsonii, and pollen on a shoe after hiking for a short distance in the area of the Visitor Center, while trying to avoid stepping on any flowers! See also Pictures shown here on prior dates. See Bloom Reports from the Anza-Borrego Desert for an introduction to this page, extensive general information (not specific to this year) about Annual Germination, Growth and Blooms, including what influences the duration and extent of the annual bloom, photo galleries, and links to other webpages giving information on Anza-Borrego Desert State Park Blooms. The Borrego Desert floor, at elevations of ~600 to ~1500 feet in the immediate area of Borrego Springs and west, is now in full bloom, and flowers line portions of S22 along the lower Montezuma Grade. The best area for blooms is along Coyote Canyon Road. 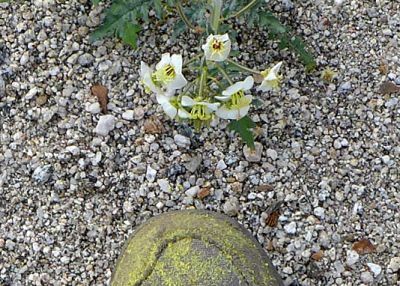 The Visitor Center area has a decent display, with a number of plants of 76 species in bloom, but the plants in the sandy areas along Coyote Canyon Road are more robust, with many more blooms per plant. The Plots of the Number of Species and Plants in Bloom On Each Trip show we are now at the usual peak in the number of species and number of plants in bloom. In fact, the number of plants recorded in bloom on 20 February 2015 is the highest we've ever recorded at this time of year! 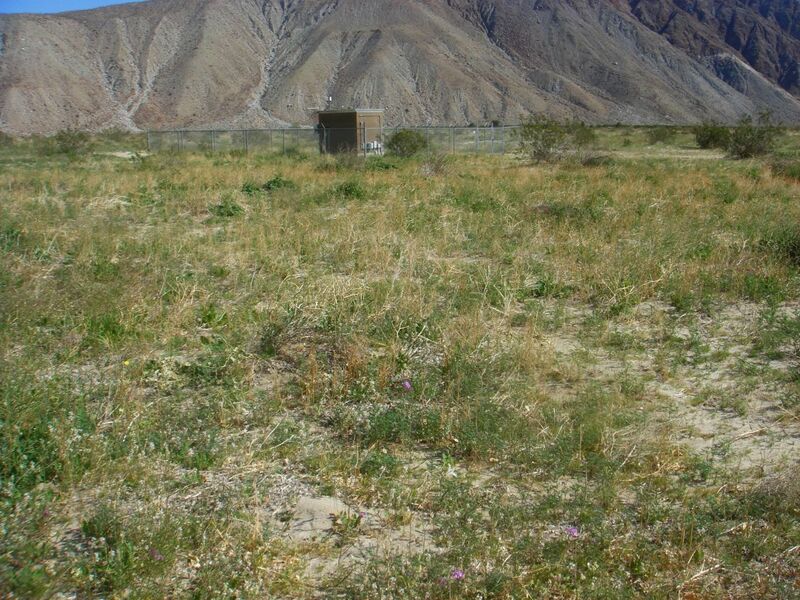 The Borrego Desert floor went from having very few blooms on 5 February 2015, to being in full bloom on 20 February 2015, just 15 days later, due to an unusually-warm period, combined with the low rainfall received this season. The number of plants in bloom (counting a maximum of 99 plants for each species), went from 334 plants of 29 species on 2/5/15 to 3317 plants of 82 species on 2/20/15! This is not necessarily a good thing, since it may mean the bloom won't last very long this year, as the plants try to reproduce before they run out of water. The bloom is beginning at elevations of 3000 feet, but is still a long way from full bloom there. This year is an amazing year on the desert floor in the Borrego Springs area. For the first time since 2005, Sahara Mustard, Brassica tournefortii, is not the dominant plant on the sandy desert floor. By the year 2010, we thought we would never again see a native wildflower display at the end of the pavement on Di Giorgio Road, since Sahara Mustard had taken over the area (see photo). But three years of severe drought has knocked down the Sahara Mustard population, and this year we are once again seeing what the desert here used to look like prior to the Sahara Mustard invasion. See Sahara Mustard Reduction in Numbers in the Borrego Desert Floor in 2015. Although this by no means is even a good rainfall year, it has been a "good-enough" rainfall year which has produced a good wildflower display in the Borrego Springs area and west, for the first time in five years (2010 was the last decent wildflower display on the desert floor). It is a real joy to see species in flower that we haven't seen for five years! See List of species observed in bloom near the ABDSP Visitor Center on 20 February 2015. Additional species observed blooming in the lower Montezuma Grade were Bahiopsis parishii, Bebbia juncea var. aspera, and Chylismia cardiophylla ssp. cardiophylla. However, once again, there are very few blooms in the areas east of Borrego Springs this year, and those areas still look parched. If we get no more rainfall, and the weather turns hot again, the bloom will end soon on the desert floor, and it won't be good for blooms at higher elevations. Plants are already wilting during the day in many places, and some plants are almost dried up in areas under shrubs, a very unusual occurrence. 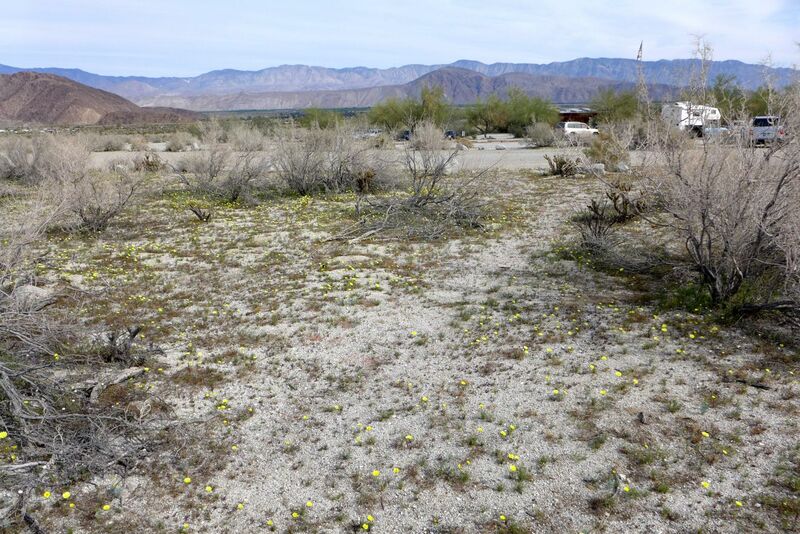 If we get more rainfall, and the weather stays cool, it could continue to be a good bloom year in the immediate Borrego Springs and west for several weeks. Copyright © 2008-2015 by Tom Chester, Adrienne Ballwey, and Keir Morse.